So you we’re driving down hwy 85 in your Subaru Outback and you notice someone with your exact same car driving along side you except they have an addition to their roof…whatever could that be? It’s a Roof Rack Tent also known as a Roof Top Tent. 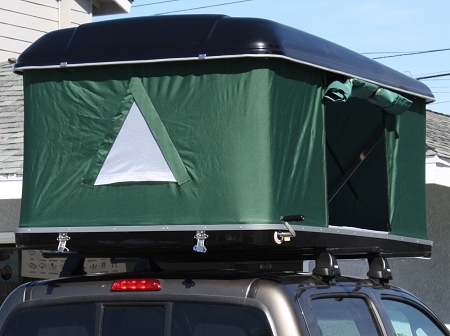 Roof Rack Tents are an efficient way to utilize the space on top of your car or truck and convert that wasted space into a fully functioning sleeping area. There are many ways you can take advantage of the ability to use your vehicle as a camping vehicle or offroad vehicle. R.V’s can be expensive and cost a lot of money to maintain. A Roof Rack Tent will allow for the same convienences as a motohome or camping van minus the expense. People use roof racks in many ways they are rated for weight. Most roof racks have a dynamic weight limit of about 175 lbs however the static weight limit which is the non-moving rating is tripple that at around 600 lbs remember the weight is disributed by the roof rack. When it comes to turning your vehicle into a fully self-contained camping car a Roof Rack Tent is what you should consider.